The peripheral component interconnect (PCI) bus is the dominant bus system used to connect the different elements making up today's high-performance computer systems. Different PCI implementations have also been developed for such applications as telecommunications and embedded computing. If an application calls for high speed, high reliability, flexible configuration, and bus mastering, then PCI is the only logical bus choice. 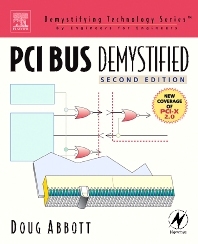 This book is an applications-oriented introduction to the PCI bus, with an emphasis on implementing PCI in a variety of computer architectures. Special attention is given to industrial and mission-critical applications of PCI bus.